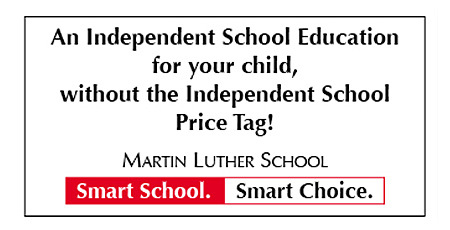 Martin Luther School is an independent school conveniently located in Maspeth, Queens. We have offered NYC high school students a quality, Christian education for the past 50 years! And beginning in September of 2011, we will expand our curriculum to include Middle School for students in grades 6, 7 and 8! Through the curriculum of the Advanced Placement Program, our high school students earn college credit in high school, and they are equipped with skills in critical thinking, collaboration and problem solving to prepare them for college…and beyond! Our 21st Century Leaning model prepares all of our students for tomorrow's technology with tools like Smart Classrooms, laptop computer labs and online grading and assignments. Learn more about all Martin Luther School has to offer! To receive an application packet, please call (718) 894-4000 or send an e-mail to Admissions@MartinLutherNYC.org. Stop by one of our Fall Open Houses (Saturday, October 16 from 9 AM - Noon; Thursday, November 4, 6 - 8 PM) to tour our facility, meet current students, faculty and staff and learn about our tuition (which is a fraction of other Independent schools), Grant In Aid and Scholarship opportunities.